Coming to Canada with a criminal record means that you may be criminally inadmissible. Criminal inadmissibility means that, due to your past criminal records, your entrance to Canada is denied. Regardless of the importance or duration of your travel, your criminal inadmissibility remains. If you are struggling with dealing your criminal inadmissibility, you are encouraged to familiarize yourself with the surrounding laws and policies. If this sounds daunting to you, don’t worry! In this blog, you will learn about grounds of criminal inadmissibility and how to overcome your inadmissibility. Why are people with criminal histories, even very minor ones, not allowed to enter Canada? This is primarily due to security reasons. Immigration, Refugees and Citizenship Canada (IRCC) and Canadian Border Services Agency (CBSA) are both committed to ensuring the security of Canada and its citizens. That said, it is their responsibility to deny entrance of any and all persons they feel are likely to pose security threats to all Canadians during their visit to Canada. You are required to show your passport and any necessary visas to a border agent at the port of entry. When the border agent scans your passport, they will have access your personal information, including your criminal record. This is especially true for US citizens, as the USA and Canada do share databases. More specifically, border agents have access to the United States National Crime Information Center and State police databases. In addition, border agents at international airports receive passenger lists and conduct background checks on the names that appear on them. Whoever has a criminal record on the passenger list will be red flagged, hence the secondary screening. With the information they have available, border agents will determine a person’s admissibility to Canada. A lot of individuals have the misconception that they shall be admissible to Canada, because their offenses are minor. This is not exactly true to the Canadian Government. To determine whether or not you are admissible to Canada, you must take Canadian laws into consideration. The only way to see if you are criminally inadmissible to Canada is to first compare your conviction with Canadian law. In fact, what matters is not the offense itself, but what its equivalent would be in Canada, and the applicable punishment. In other words, how the offence is viewed in Canada is the overarching factor in the determination of an individual’s criminal inadmissibility. The more serious the offence is in Canadian law, the more likely an individual will be found inadmissible. While DUIs may be considered as a misdemeanor in the USA, Canada takes those very seriously. That said, DUIs can lead to criminal inadmissibility, as they can be recognized as indictable offenses in Canada. Determining Canadian equivalence of your offence can be tricky and overwhelming. If the correct Canadian equivalence is not found, you may falsely believe that you are admissible to Canada. If you do not take care of your inadmissibility with the correct methods, you could be turned around at the border unexpectedly. you were convicted in a country which does not have special provisions for young offenders, but the circumstances of your conviction are such that you would have been treated as an adult in Canada. Determining whether or not you are criminally inadmissible is not a simple task, but this is just the beginning! After you have determined your inadmissibility, you are highly encouraged to overcome it. There are several ways, including applying for a Temporary Resident Permit or Criminal Rehabilitation, to overcome your criminal inadmissibility. However, it is highly recommended that you seek professional help before you attempt to do the application on your own. 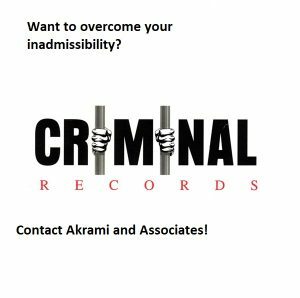 At Akrami and Associates, we assist clients with inadmissibility and have completed numerous successful applications. Call 1-416-477-2545 to book a free consultation today! As previously mentioned, Canadian government is very strict when it comes to assessing foreign travelers’ inadmissibility. In order to compile a strong temporary resident permit or a criminal rehabilitation application, you will need to prepare for the correct documents. However, having to prepare all the required documents can very confusing and exhausting. It is also essential to note that this type of application is difficult to pursue on your own. Therefore, it is highly recommended that you seek professional and experienced help prior to submitting the application. Akrami & Associates work and have experience with many different immigration matters. We have helped many of our clients create strong temporary resident permit and criminal rehabilitation applications. Please feel free to contact Akrami & Associates at 1-416-477-2545 ( info@thevisa.ca) for more information, or if you would like to book a consultation with an immigration professional for more advice. With Akrami & Associates, there is always a way!